“Hmmm, this could work,” my husband said, taking a big swig of the creamy white drink. “Wanna know first impressions? Cookie dough.” He drained the rest of the RAW Fit smoothie and headed off to work. He’s hoping to lose weight naturally with the help of this Vegan protein powder. It’s said that breakfast is the most important meal of the day. My husband, however, is a night owl who is used to rolling out of bed, pouring his coffee, and walking out the door. After years of odd hours because of shift work and university classes, he’s not very good at getting either a solid breakfast or lunch. He runs on coffee for most of the day. So a big step to helping him to lose weight naturally has been simply starting the day with a healthier breakfast. 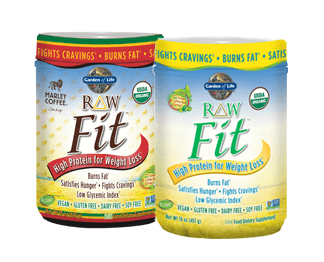 Garden of Life makes this easy with their RAW Fit products. In the same time that it takes him to make his morning coffee, my husband can now whip up a healthy, tasty smoothie. He doesn’t have to wake up any earlier to make breakfast, so this one simple habit change has actually been making a difference. In fact, when he finished his first container of RAW Fit, he sent me looking for more in our local health food stores. RAW Fit is an organic, raw, plant-based, vegan, high-protein powder. My husband liked the fact that it’s all RAW; when one of our local health food stores didn’t have the Garden of Life products, the clerk tried recommending another vegan option but noted that only Garden of Life products are raw. RAW Fit supports healthy blood sugar levels and burns fat naturally, helps regulate stress, promotes healthy digestion, is naturally filling, and helps build, repair and sustain lean muscle mass. My husband simply mixed it with water to drink, but it can also be added to any smoothie recipe for a delicious breakfast, lunch or snack. After my husband’s rave review, I tried some for myself. I didn’t like it as much. There was a slight aftertaste from the natural sweetener. We’ve tried a few other high-protein smoothie powders and all of them have a taste or texture that I can’t get past. If you’re like me, you may have to experiment with smoothie recipes to find something you like. Or, like my husband, you may find that you don’t have a problem with the taste and texture. Garden of Life also sent us a bottle of FucoThin Green to try. This is a vegan, gluten-free, dairy-free, soy-free supplement that helps boost metabolism and support healthy blood sugar levels to help you lose weight naturally. When taking this, my husband found he felt less hungry and had fewer to visit the sushi restaurant around the corner from his office. These capsules were also easier to pop into a pocket or bag than the protein powders, to use throughout the day. If the taste of the protein powders isn’t for you, a product like this could help with your weight loss goals. If you’re looking to lose weight naturally, check out RAW Fit. Garden of Life also has a great selection of vitamins for the whole family. I received these products courtesy of Garden of Life for the purposes of this review; all opinions expressed are my own. I’ve tried many different powders as well and cannot get past the taste and texture. The pills sound like a good alternative though! I am always looking to try more vegan protein powders. I like to put them in my breakfast smoothies. This is one I haven’t tried. I’ll have to check it out! I need to lose a few pounds…maybe more than a few lol…and need all the help I can get. Like your hubby I often skip breakfast but there is really no excuse for skipping a breakfast as easy as this. Thanks for the review. I need to lose some weight. I need to check this out. Interesting product! Usually something that is good for your doesn’t taste good! lol Do you buy chance know if its Gluten free too?? This sounds like a great product. I’ve got to check it out. My husband is an eat on the go kinda guy too.